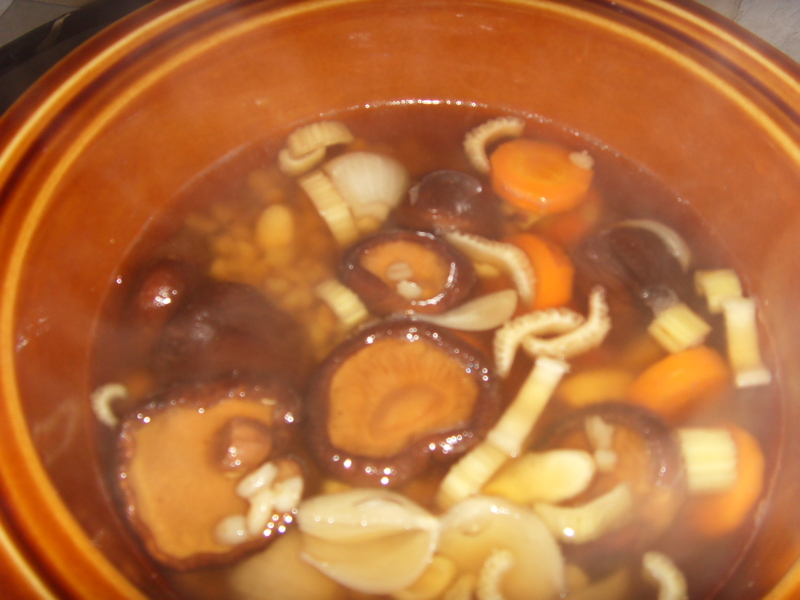 Yesterday was a rich kind of soup, then I ate a bit of nonsense… ok maybe too much nonsense, so today I feel like eating something light and easy and no fuss but must be tasty since the last few days I have been having tasty soups. I was looking for the Tau Foo Fa man last night, the one who cheated me off RM1 the other day. I will tell him off just you see, but I needed Tau Foo Fa but he was not there. I am sure he will be there later. 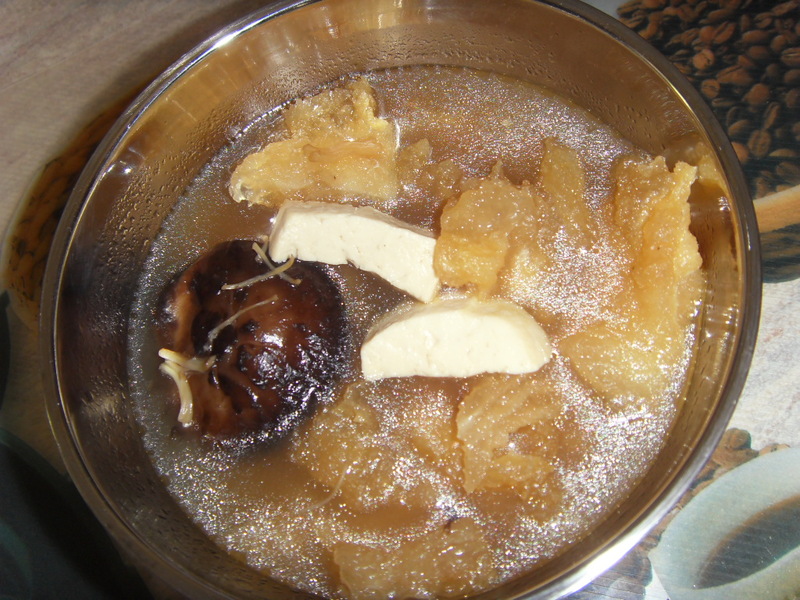 Today I want to make a soup using Tau Foo Fa because it is a lot smoother then then soft tofu, and it will be with a green vegetable which I have not picked, and I was thinking of adding some Nam Yee (Fremented Bean Curd Paste) just for some kick. Nam Yee is nice, it stinks and can make you sick as is most Asian foods that we all like but its versatility in Asian cooking is yet to be untapped. You can make wonderful fried chicken, even in prawn dishes, a light coating mixed with this and that and fried like fritters is simply wonderful. 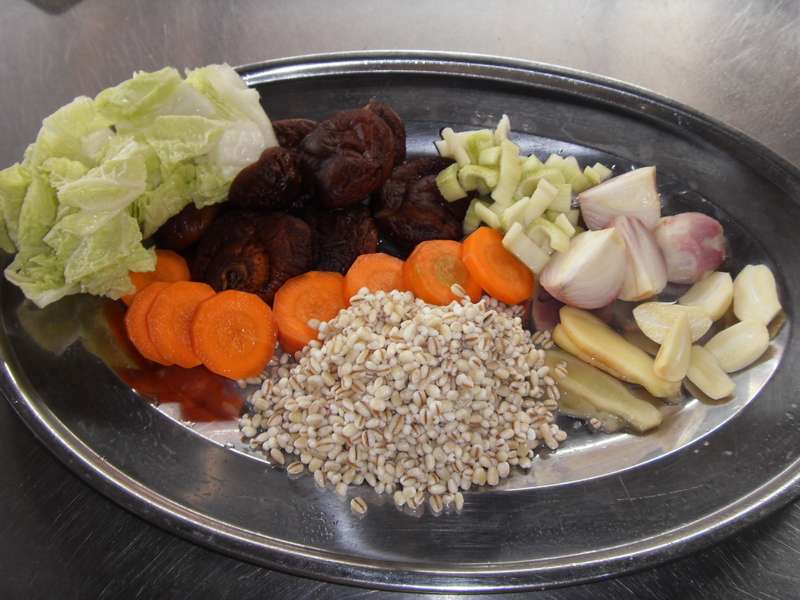 It can be added to vegetables as well, so dull insipid veggies is given a new life. It can be used to make interesting dips as well. Well enough said, here is today’s recipe. 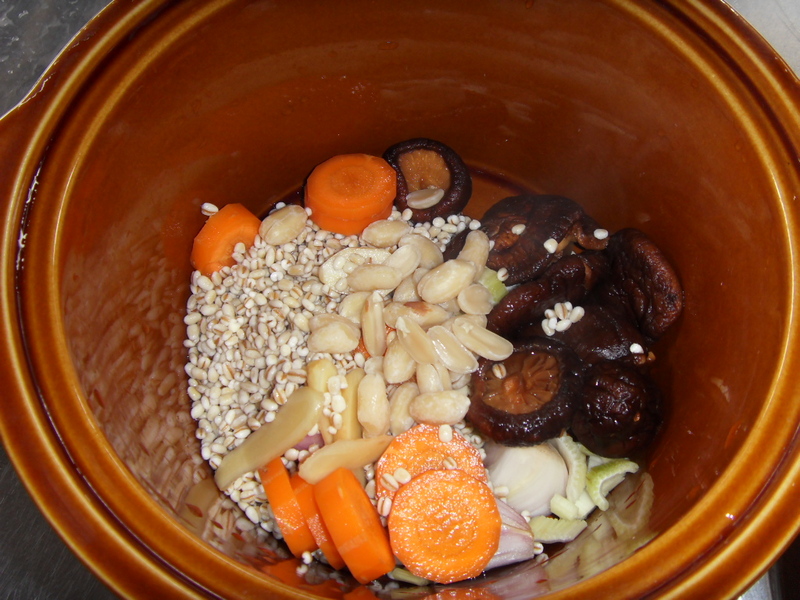 Boil Water and Garlic, add in Vegetables. 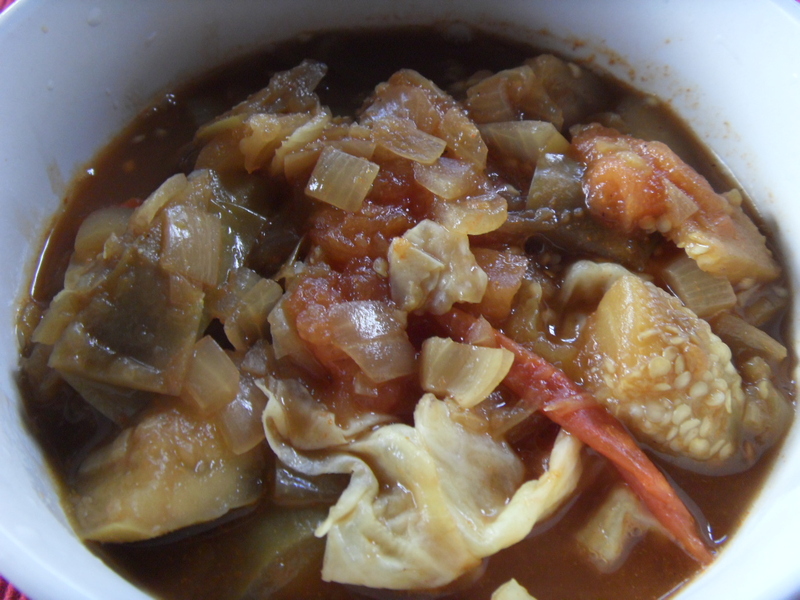 Once Veggies are soft, add in Nam Yee and gradually add in Tau Foo Fa without adding the water. Do not stir too much or the Tau Foo Fa will break up. Season and leave to simmer gently for about 2 minutes. After yesterdays Spicy Vegetable Soup, to day I feel like something a little bit similar so I’ll go with pumpkin, Just a piece of pumpkin not a big one. Pumpkin is a versatile vegetable both in the east and in the west. Mashed pumpkin made exactly like mash potatoes is really nice and rich and has a nice sweetness. Pumpkin made into a pie is just as good; in fact I have a few orders already lined up to Thanksgiving this year. Then Pumpkin cooked as a thick curry and without coconut milk as it thickens itself is really so so nice. That is the base of my soup today actually. Pumpkin is also used as a dessert in Thailand. So its versatility is boundless. You could make a cream of pumpkin soup with this recipe by just adding some cream to it later, but today I am going to have lumpy pumpkin soup because I really cannot be bothered taking out the food processor and all as I have a few cakes to make today and lots of preparations to organize for orders on Friday and Saturday as I have two classes on Saturday so I have to make sure the girls can organize the staff. I am talking so much about the good of pumpkin and just a few years ago I would not even touch it because I hated it, it was punishment food to me…. I suppose when you’re younger your appreciation to food is different and anything that looks orange and in pieces is yucky. But not anymore…. I can just eat pumpkin curry on its own, as long as it’s not too spicy. 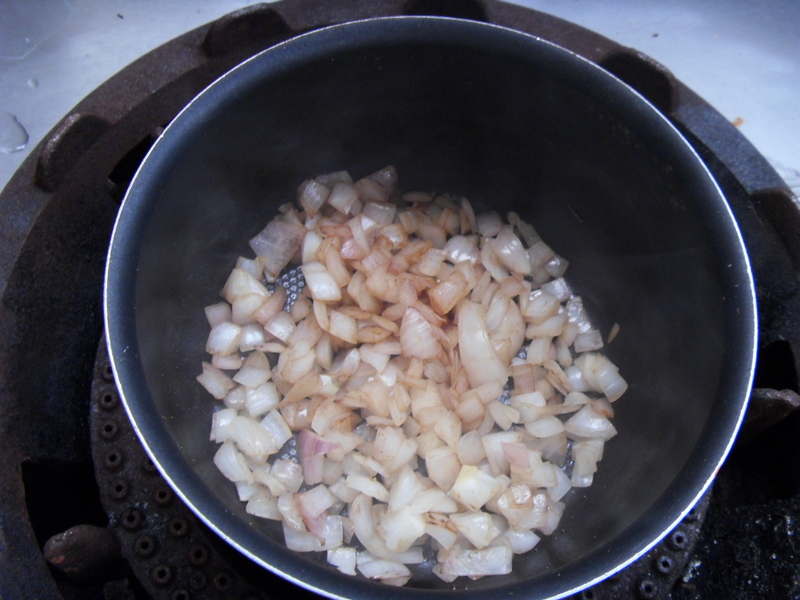 Boil onions, garlic and pumpkin together till pumpkin is soft. You may need more water, but don’t add too much. Add in curry powder and seasoning. Simmer on low flame till pumpkin is soft and pulpy. Lastly add in Green Peas. Serve hot. Easy isn’t it. And it will be tasty for sure. Today I felt like something different, maybe not a heavy soup or a light one but one that had to be just right. I did not want something bland, or something that was too heavy and too tasty, but I wanted something that would give my taste buds a tiny bit of sensation. So while digging through the fridge I found a Brinjal. Now a Brinjal could be curried and when cooked it would be quite mushy yet tasty as well. So out came the Brinjal and a Tomato and I also found nice nicely diced onions, and I found a left over cabbage. So this was the beginning of my soup. 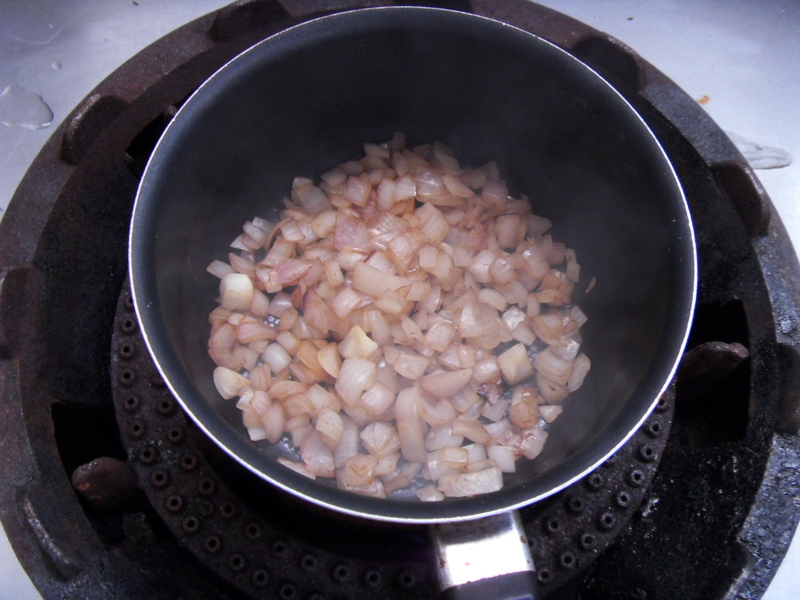 So here goes, Water Sautéing Onions. I will describe each photo. 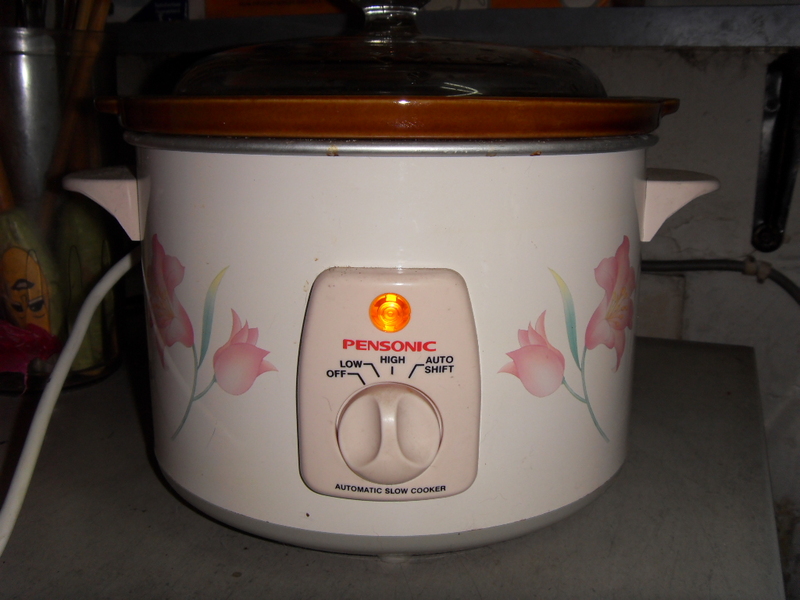 First you boil a little water in a pot, not too much, not to little about ½ cup or so. 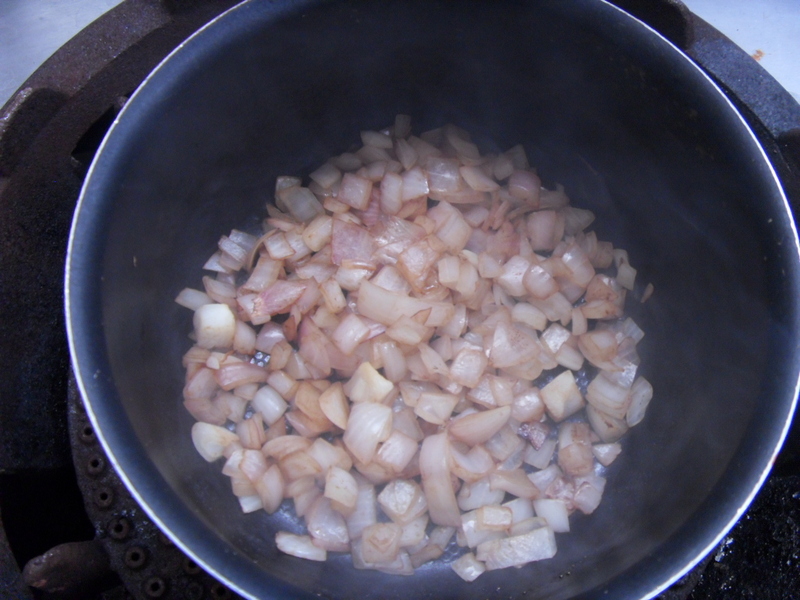 Leave the water to boil and then toss in the onions. 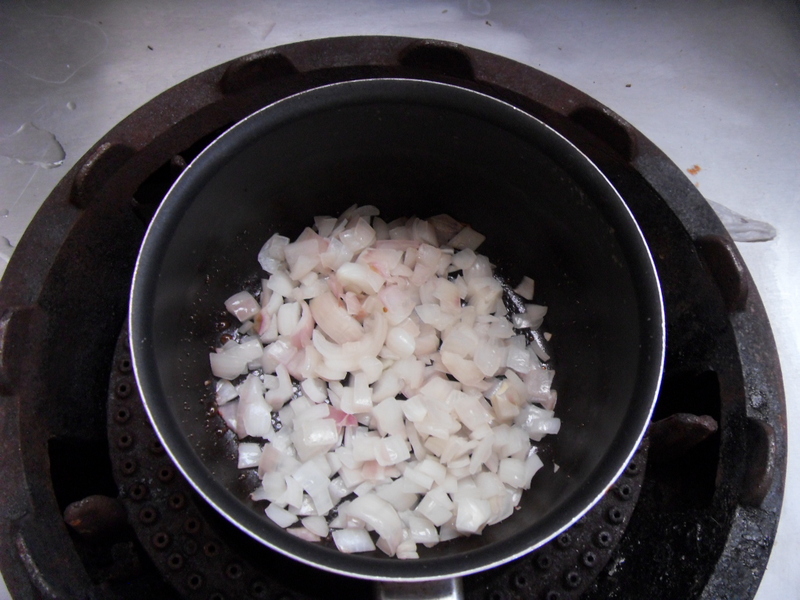 Then toss the onions around either with a spoon or by jostling the pot around to move the onions. Let it cook on steady heat. By now the water would have lessened. 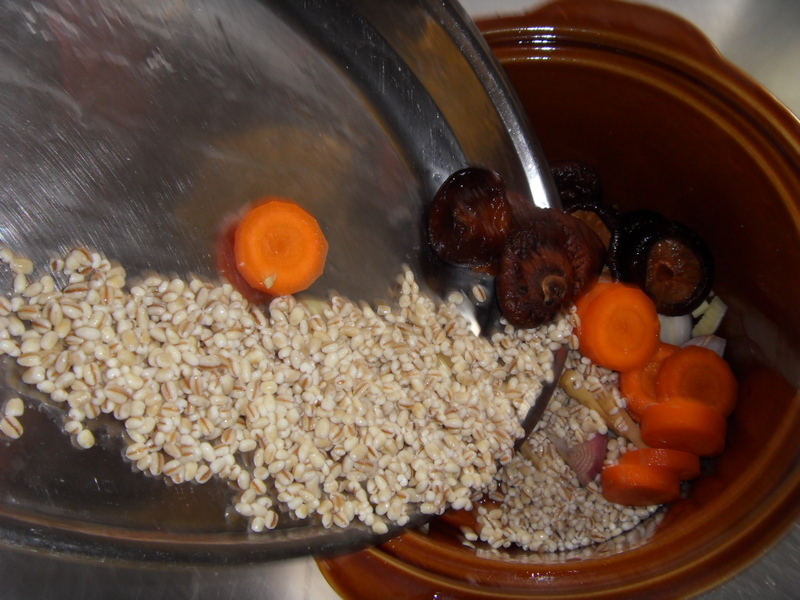 When it is brown enough and by now it should be totally dry, add in the cup of water. The color will be an instant brown. So there you go, next time you want to sauté something try this method. 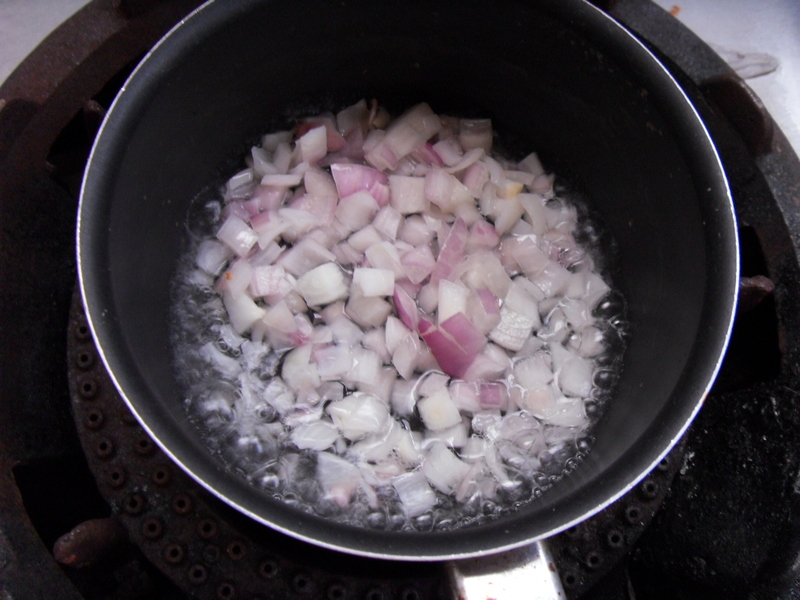 Once you have sautéed the onions as explained below, add in the brinjals and tomatoes. Let it simmer till the Brinjal is soft and almost not visible. Season and add in the curry and chicken powder. Add in the Cabbage Leaves. Once Cabbage leaves are soft, remove from heat and serve. I found this soup to be really nice and tasty and my brother who has been turning his nose up to my soups of late actually ate most of it. So I only had half a bowl of soup today and nothing much else. Shocking right? Today’s soup is a little overdue. I was busy yesterday and I am sure you can notice from the blog what I was up to, so today I will be uploading two soups I made today. Its hard to believe this is Day 13, and I am still plodding along. Today’s soup is well, as usual rather simple. Its just broccoli and Kei Chee soup. Kei Chee gives out such a nice flavor to anything you add it to and a very rich color as you will notice in the photo. I am only using three ingredients for this gloriously light soup, and as quickly as it simmers, you will notice the richness in its color. 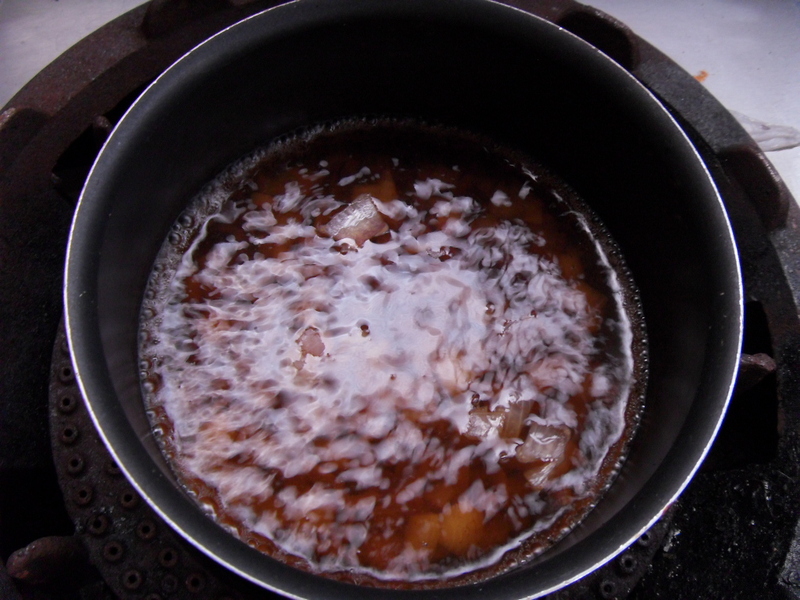 Boil water with Kei Chee and Garlic. 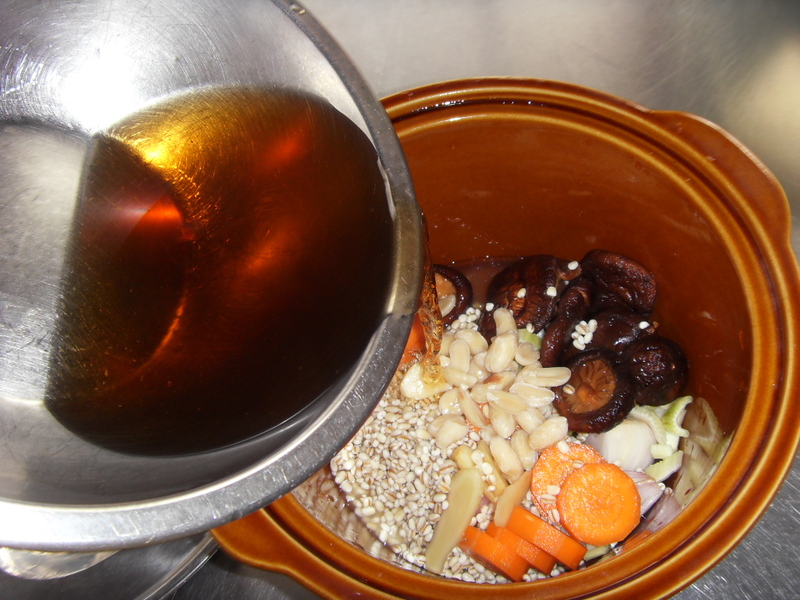 Leave to simmer for about 20 minutes so a nice rich color of strong tea will appear. 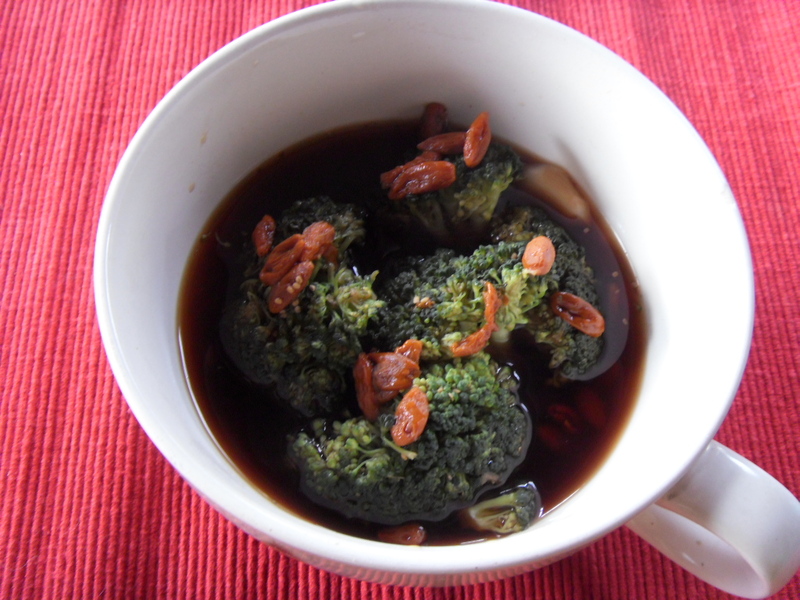 Add in Broccoli, leave this a little longer as in soups broccoli should be a little bit softer.